Antique Indigo Wrench. The quilt is made from assorted indigo fabrics, on shirting background. The blocks are 7.5 square, set in a rust red solid sashing. It is machine pieced and quilted. 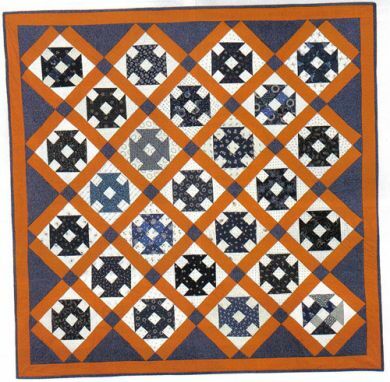 The quilting is "in the ditch" with featherd pattern in the side triangles. Used lightly about the house and washed once upon completion of the quilting. Overall size in 58" square.